Editing branch versioned data is only available through feature services. After registering data as branch versioned, you will need to publish the data to your organization's portal as a web feature layer. The data will then be available as a feature service and can edited and participate in branch versioning workflows. For more information on feature services, see What is a feature service? For more information on sharing web feature layers, see Web feature layer. When you publish branch versioned data, there is an option to enable Version Management capabilities. The version management service is responsible for exposing the management capabilities necessary to support feature services that work with branch versioned datasets. To work with branch versioned data in isolated versions and have it participate in versioning workflows, Version Management must be enabled when publishing the service. Create, modify, and delete branch versions. Change the branch version for active feature layers in the map view. Reconcile and post edits for an active feature layer version. Undo or redo individual edits that have been made throughout an edit session. Save or discard edits for the entire edit session (when working within a named version). 10.5 and earlier ArcGIS Server instances are not supported. If Version Management is enabled under Capabilities, all datasets must be of the same registration type. If Version Management is not enabled under Capabilities, publishing a mix of data types is allowed with the exception of traditional versioning. All data must belong to a branch workspace. All data must be published from the default version. The connected geodatabase user must be the owner of the data. Definition queries must not be present. All fields must be visible. These errors will show up when you run the analyzer or try to publish in the Share As Web Layer pane. All analyzer errors must be resolved before you can complete the publishing process. Share the map and all of its layers as a web layer. On the Share tab in the Share As group, click Web Layer . 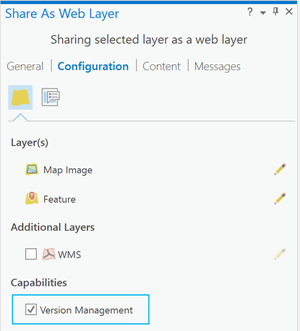 Share selected layers from the map as a web layer. Select the layers in the Contents pane. Right-click and choose Sharing > Share As Web Layer . Provide the name for the web layer. By default, the web layer will be saved to My Content. You can save the web layer to a folder in My Content by typing the folder name or browsing to an existing folder. For Data, check Reference registered data. Enabling Reference registered data will include a map image layer. For Layer Type, click Feature. Complete the Item Description fields for Summary and Tags. My Content—This option only references content in your personal workspace named My Content. Your content is inaccessible to other users. Everyone—This option makes your content public. This means anyone can access and see it. Groups—You can share your content with groups you belong to and members of those groups. Optionally, you can enable version management on the branch versioned dataset. This is not required when sharing branch versioned datasets, but it is required if you would like the feature layer to participate in version workflows as described previously in this topic. Click the Configuration tab and under Capabilities, click Version Management. Optionally click the Content tab to view the new web layer or layers and all associated components. Since Reference registered data was selected, you can click the Federated Servers drop-down arrow to choose where the layer will be shared. Only federated servers that you have access to will be listed. Click Analyze to check for any errors or issues. You must resolve all errors. If any issues are discovered, they show on the Messages tab. Right-click each message to get more information, read the help for the error or warning, and access suggested fixes. Once validated, click Publish to share your web layer. Once the web layer has successfully published, click the Manage the web layer link to manage the web feature layer through your portal. Since Reference registered data was selected earlier, the link will take you to the map image layer.